Your feet are what get you to the summit, so protect them from the world's harshest mountain environments with the Millet Men's Everest GTX Mountaineering Boot. This expedition-grade boot features a Cordura upper covered by an integrated Gore-Tex gaiter for boot-packing up steep ridges. An automatic crampon attachment secures your spikes, and the fiberglass and carbon footbed provides a rigid platform for frontpointing on technical pitches. The Everest's removable liner features aluminum to reflect heat and a microcellular midsole to insulate underfoot. 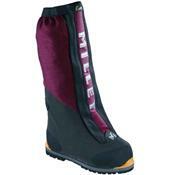 Aramid threads in the outer gaiter resist abrasion from rocks and ice, and the elastic collar seals out blowing snow.